1.2 How does FTP work with my Shared Hosting? 1.3 How do I find the Server Host for XMission's Plesk Shared Hosting? 1.4 How do I connect to XMission's Plesk Shared Hosting FTP server via an FTP Client? 1.5 SFTP doesn't work for me. How do I connect over FTPS? FTP (Secure File Transfer Protocol) is a protocol used to transfer files over a TCP/IP network (Internet, UNIX, etc.). For example, after developing the HTML pages for a website on a local machine, they are typically uploaded to the Web server using FTP. FTP includes functions to log onto the network, list directories, and copy files. FTP operations can be performed by typing commands at a command prompt or via an FTP client running under a graphical interface such as Windows. 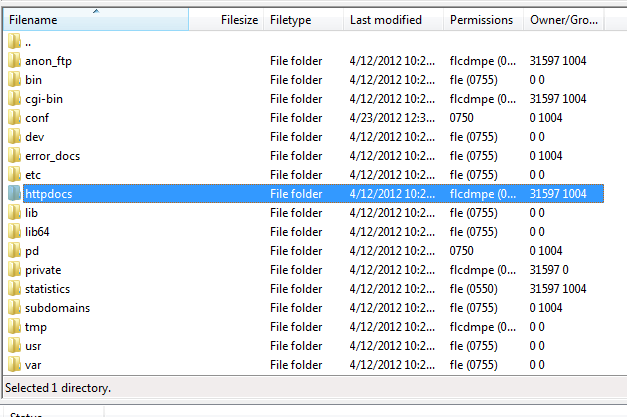 We highly recommend using an FTP client, such as Filezilla which is available at http://filezilla-project.org/. The SSH file transfer protocol (or SFTP) transfers files and has a similar command set for users, but uses the Secure Shell protocol (SSH) to transfer files. Unlike FTP, it encrypts both commands and data, preventing passwords and sensitive information from being transmitted openly over the network. How does FTP work with my Shared Hosting? FTP is the recommended way to upload the files you have created for your website to our server. In general, FTP, both as a command-line function and as utility, is more reliable than uploading files via your web browser. It is also a useful tool in making files available to friends, family, or clients without sending bulky attachments via email. How do I find the Server Host for XMission's Plesk Shared Hosting? If your domain is not pointing to XMission servers and you are developing your site, follow the instructions below. The first thing you'll want to do is log into your Plesk Control Panel at http://hosting.xmission.com. 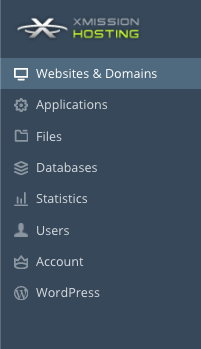 For more information about logging into your Plesk Control Panel, please see Administration/Logging in. Next to your domain name you should see Hosting Settings. It can also be found in the Show More tab. How do I connect to XMission's Plesk Shared Hosting FTP server via an FTP Client? NOTE: If your nameservers are not pointing to XMission, please use the IP address for your shared server for your host name. This can be found in your Websites and Domains tab. If you are connecting to a server for the first time, Filezilla will ask you to confirm the connection. Simply click OK to progress. SFTP doesn't work for me. How do I connect over FTPS? 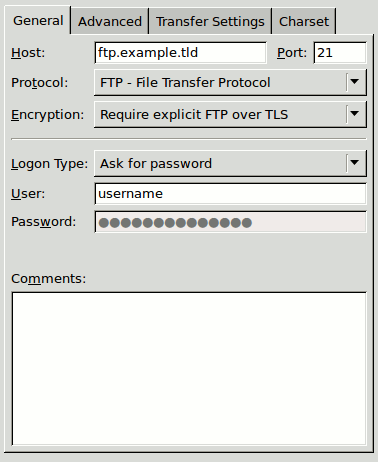 If for some reason you are not able to connect with SFTP over port 22, there is the option to connect with FTPS over port 21. These instructions are specific for Filezilla, but the settings themselves should work in any client. First, open up the Site Manager. In here, click on New Site. This will allow you to edit the connection details for a new site. Input your credentials (username, password, host name), and otherwise match the settings to what you see below. Once you're all done, click Connect. This page was last modified on 27 October 2017, at 10:32.